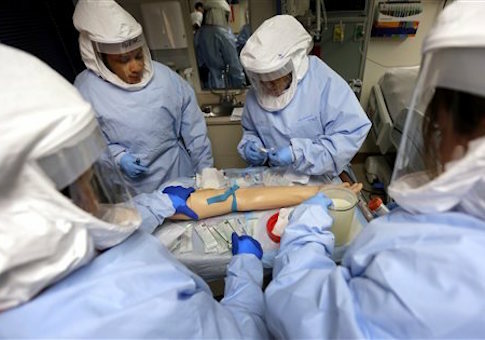 The Pentagon announced Wednesday that "all U.S. military service members" returning from Ebola plagued countries in West Africa would face a mandatory 21-day quarantine to ensure they are not infected with the deadly disease. Secretary of Defense Chuck Hagel signed the order early Wednesday after first oscillating about the decision, which was recommended by the Joint Chiefs of Staff. U.S. service members stationed in West Africa to help fight Ebola will now face "a 21-day controlled monitoring regimen," the Pentagon announced. "This order will apply to all military services that are contributing personnel to the fight against Ebola at its source." Hagel also has given the Joint Chiefs 15 days to develop "a detailed implementation plan for how this controlled monitoring will be applied across the force that takes into account the size and scope of the logistics required for this effort," according to a statement by Pentagon Spokesman Rear Admiral John Kirby. The Joint Chiefs also have been directed by Hagel to "conduct a review of this new regimen within 45 days from now," according to the statement. "This review will offer a recommendation on whether or not such controlled monitoring should continue based on what we learn and observe from the initial waves of personnel returning from Operation United Assistance," the Pentagon said. Hagel insists that these "initial steps" will help mitigate the spread of Ebola should any U.S. military member be infected. "The secretary believes these initial steps are prudent given the large number of military personnel transiting from their home base and West Africa and the unique logistical demands and impact this deployment has on the force," the statement said. "The secretary's highest priority is the safety and security of our men and women in uniform and their families." "Last Friday, I questioned General Lariviere regarding the Department of Defense’s Ebola guidance for service members being deployed to countries with Ebola outbreaks," said Rep. Mike Turner (R., Ohio). "I’m encouraged that Secretary Hagel shares my concerns and is taking action to impose a 21-day ‘controlled monitoring' period for all returning troops," he continued. "This act will ensure that our service men and women, their families, and our communities have the confidence that every necessary precaution is taken to ensure their health and safety." President Obama himself has rejected the idea of quarantining doctors engaged in efforts to combat Ebola. Obama appeared to be lashing out at several state governors who have enacted their own quarantine policies for some doctors. Quarantines, Obama maintained, are a fear-based reaction to the disease. "We don’t just react based on our fears," Obama said on Tuesday. "We react based on facts and judgment and making smart decisions." Hagel spent much of Tuesday debating the Joint Chiefs recommendation to enact the quarantine and appeared to have accepted the advice early Wednesday. This entry was posted in National Security and tagged Chuck Hagel, Ebola, Pentagon. Bookmark the permalink.